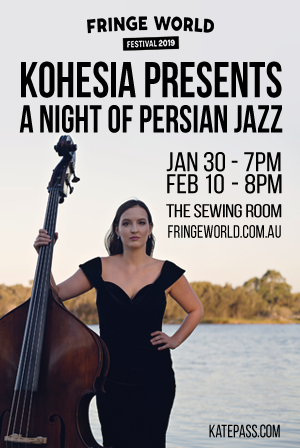 For those looking for something a little different, exotic and intriguing at FRINGE WORLD, Kohesia Presents: A Night of Persian Jazz may just be what they are looking for. Led by double bassist Kate Pass, the Kohesia Ensemble promises to take you on a journey to experience the evocative sounds of Persian music played with distinctive jazz stylings on Wednesday, January 30 and Sunday, February 10 at The Sewing Room. 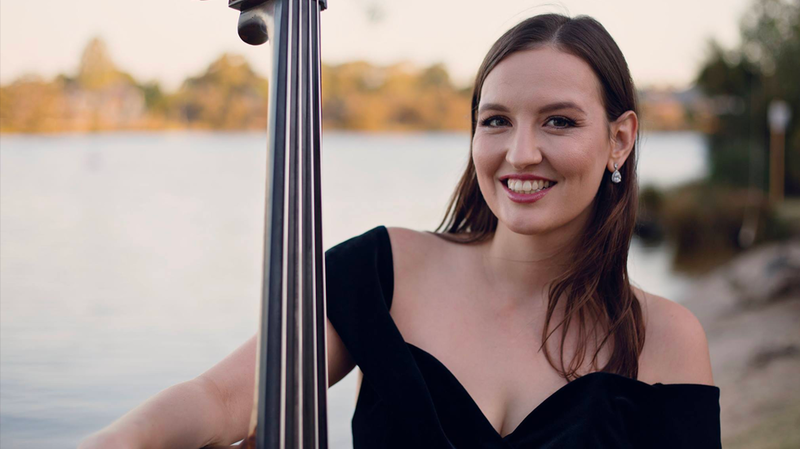 After several successful national and international tours including performing at the prestigious Metropolitan Museum of Art in New York, Kate Pass paused to talk to CHERYL LIM about what inspired her to create a show with uniquely lush music born of Persian culture and jazz. You’ve certainly gotten into playing a unique style of music as a career. How did your journey into music begin and did you think it was always leading you in this direction? I always loved being creative and playing as a child, but I certainly never thought I’d end up as a musician. I was lucky to have great music teachers throughout high school that encouraged me to play jazz and improvise. I tried several instruments, but when I started playing bass at 14, I knew I was hooked! I think when you start playing an instrument as a child you have no idea where it will lead you. My life so far has just been a series of saying “yes” to a range of weird and wonderful opportunities that led me to where I am now, and meeting a bunch of awesome people along the way. What does ‘Kohesia’ mean and why did you choose to name your ensemble ‘Kohesia Ensemble’? “Kohesia” is a play on the word “cohesion”. It’s really a mission statement for the ensemble. The aim has always been to present music that was very cohesive, despite the disparate backgrounds of musicians within the ensemble. We are not trying to impose elements of Persian music into jazz, or vice versa, but work together to create music that is wholly new and unified in its approach. And, of course, I wanted to draw attention to the fact that we are an “ensemble,” everyone’s voice and musicianship contributes greatly to the end result. What made you start composing music that combines jazz and Persian music? At the time when I started composing music, I was playing in a Middle Eastern band called Daramad, with current Kohesia members Reza Mirzaei and Mike Zolker. I found playing in this ensemble extremely inspiring, and naturally started writing music similar to what we were playing. I also really enjoyed the shared emphasis on improvisation, that is key to both jazz and Persian music. I love composing music that stretches musicians to improvise in a new way, while still allowing them to shine. How does Persian music differ to other genres, and have you found it challenging writing and playing music combining different styles? The modes and use of microtones that are central to Persian music make it quite unique from Western music. Trying to honour the sound of these modes when writing for a combination of Western and Persian instruments is a challenge. It involves being very careful about orchestration, texture, structure and harmony (chord choices). One of the main challenges with combining different styles of music is to always be respectful and understanding of the traditions the music stems from. I am constantly learning and trying to understand both Persian music and jazz on a deeper level. I think this attitude is essential, in order to produce music that is meaningful and relevant to a wide range of people. And how does it lend itself to being composed on the double bass? Does the fretless nature of the instrument allow you to be more fluid with the different kinds of notes and scales that are required? It’s amazing how well double bass lends itself to Persian music, especially considering there isn’t really an equivalent instrument in traditional Persian music. The fretless nature of double bass is similar to the oud (Middle Eastern lute) and allows me to more easily access microtones – notes in between the notes that aren’t found on a piano, or in Western music generally. The range and role of the instrument also allow me to provide different textures that I feel enhance the sound of other Persian instruments in the ensemble, such as playing drones, rhythmic driving patterns, and suggesting a moving chord progression without dictating exact harmony, keeping it open for soloists to improvise within a mode. You’ve performed several tours nationally and internationally as well as appeared in festivals and events around the world and at the Metropolitan Museum of Art in New York. What have been the highlights for you? I’m very lucky to have the opportunity to travel so much with music! Playing at the Metropolitan Museum of Art in New York with Persian singer Tara Tiba was definitely a highlight, as well as extensive touring in Europe with Adam Hall. Every opportunity to travel with music is a gift. I love exploring new places and meeting people from around the world, connecting with people through music. Music has a way of breaking down barriers, and makes you appreciate the commonalities between humans all over the world, despite cultural and language differences. It must have taken some special musicians to help bring this to life onstage. Who is joining you for the shows and what kind of performance can we look forward to if we get down to the Sewing Room? Absolutely, there are some extremely special musicians and friends joining me as part of the Kohesia Ensemble. The shows will feature a new band member and old friend – Reza Mirzaei on saz (Persian lute), as well as Mike Zolker on oud (Persian lute), Esfandiar Shahmir (daf and ney), Chris Foster (piano) Ricki Malet (trumpet), Marc Osborne (saxophone), Daniel Susnjar and Alex Reid (drums). We will be playing original music, including some songs from our latest album, as well as new compositions. Audiences will be able to hear each musician shine in their own way, while contributing to the amazing ensemble sound that is Kohesia.